There’s a reason a great content strategy drives conversions in retail marketing: it makes it easy for consumers to move from thinking about a product to actually buying a product. In this sense, content has taken the guesswork out of how this product would fit into their lives. Question: Why don’t more retail marketers have an effective content strategy that drives conversions? The answer is that most marketers don’t connect the dots from content to product as readily as they think they do. Case in point: Overstock.com’s O.info doesn’t just present relevant content—it also takes great strides to connect consumers with useful, relevant products that are readily available on its websites. A case study from Skyword documents the transformation of O.info. Overstock.com knew that it needed to identify and reach very specific audiences, but its marketing efforts didn’t fully push these consumers to make a purchase. Part of this was figuring out what they were coming to Overstock.com to buy. Was it art, electronics? Were they looking for entertainment products, a new ensemble, something for travel? The teams figured that they needed to reach young professional women, trendy moms, and recent retirees on a budget. Once they’d specified who and what, it was easy to start creating a content calendar that made sense for the audience segments and would drive more traffic back to Overstock.com. Throughout each piece, there are links to products on Overstock.com’s website, so it’s not in-your-face, “buy this product immediately” marketing. The content inspires the customer to consider adding several more products to their cart, once the blog article has shown him or her the added benefit of these pieces. 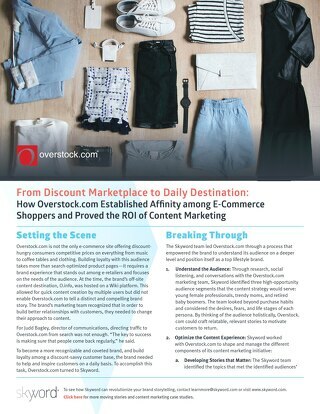 In fact, Judd Bagley, director of communications at Overstock.com, noted that after the new content strategy was implemented, customers who had read O.info had a 36 percent higher average order value over other customer segments. Those who work in retail marketing, take note. Another thing to consider: home pages, about pages, product pages, checkout pages—these are all content, and should all be used as a part of a larger content strategy to make the move from blog posts to purchase points. Digital Marketer reminded us that blogs are not the full spectrum of content—often, they’re only top-of-funnel discovery points for consumers. There needs to be an evaluation stage that follows that initial moment of discovery—and that’s where a marketer needs to make a relevant connection to the consumer in order to drive a conversion home run. At this point, many marketers forget that consumers will start to price-compare and mull over the cost of an item—this is where the need to offer educational resources, discount coupons, events, and other useful content or downloads is key. The more help you can offer a consumer, the easier you make it for them to consider your products over a competitor’s. Don’t forget, though, that in order for this type of retail marketing strategy to work, you need a robust website capable of handling different types of media. This might seem like a no-brainer, but if a website can’t support large images, video content, or downloadable pdfs, it might be time for a big update. Offering free downloads, like videos, ebooks, or other short guides, makes it easier for consumers to see the benefits of a product or a group of products. Even in retail, there is a need for learning. The key here is to have a website that functions well, so that this multimedia content can be prominently displayed for consumer interaction. O.info didn’t have a place to host rich content, like video, and needed a website overhaul to be able to support these media types. Now, its entry points are much more engaging for how-to content that consumers can learn from. For example, there might be hundreds of different types of sewing machines, but only a few make it easy to mend a frayed pair of jeans or sew dress patterns. Or, a consumer might be new to caring for plants or interior decorating. This O.info article can help them keep their new, leafy babies alive and incorporate them into their homes with style and practicality. It’s hard to stand out amongst hundreds of online retailers and the content they post every day—we get that. 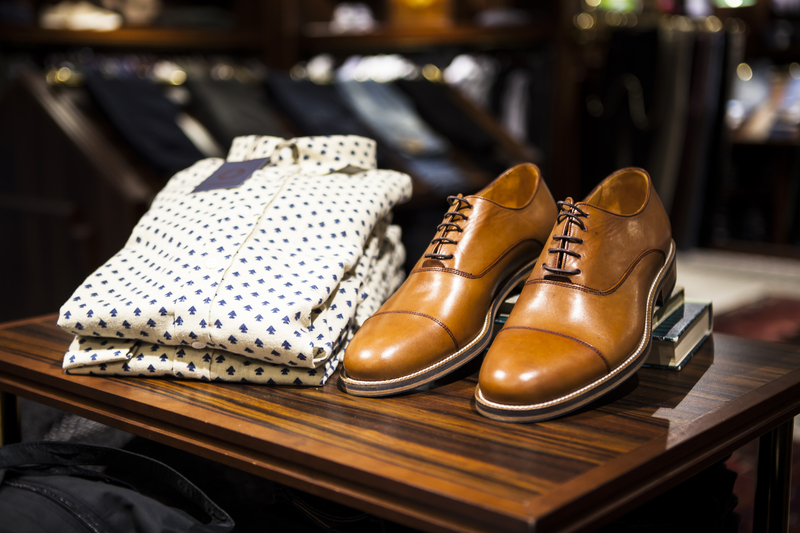 A retail marketer’s job is to offer quality, service-oriented pieces as part of their content strategy. It worked for Overstock.com: Overall, they saw that seven out of 10 unique visitors to O.info eventually clicked over to Overstock.com to start shopping. Readers of O.info were seven times more likely to convert on Overstock.com when compared to those who hadn’t read the website’s content before clicking. Seven. Times. The post How Overstock.com Is Winning at Retail Marketing appeared first on The Content Standard by Skyword. What Could the Echo Show Mean for Marketers? Are Beacons a Mobile Marketing Trend or a Dying Retail Technology?